We talk a lot about living closer to our food and making sure we know what’s IN the food we eat and serve our families. Well, on today’s episode we chat about doing the same thing for our pets. For optimal nutrition, it can be just as important for our pets to avoid processed foods too. And unfortunately, most of what we typically feed them…is junk food. Now, this topic can be controversial. And I know we don’t all have the time or money to make our own pet food or buy custom food. But that’s not what this is about. This is about having a better understanding about pet food so that we can make the best choices we can that is within our capacity. 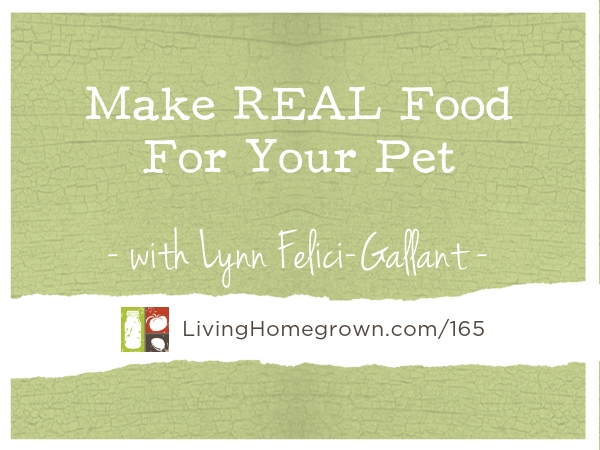 Lynn Felici-Gallant is an attorney, garden designer, and co-owner with her husband, Paul, of Paul’s Custom Pet Food LLC, based in Northwest Connecticut. Paul’s Custom Pet Food creates small-batch, handmade, ethically sourced dog food, treats, and custom pet food based on the unique dietary needs of companion animals. 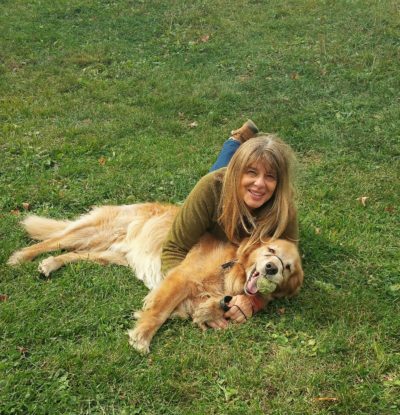 She credits the couple’s Golden Retriever, Hunter, for the start of the business and her resultant passion for pet nutrition. Hunter, who was diagnosed with fibrosarcoma in the lower jaw at three-years-old and given only six months to live, is going on 12, having survived cancer through a regimen of Chinese herbal medicine and food therapy. Lynn shared her homemade pumpkin zucchini dog cookie recipe with us! Just click the box below to download her full recipe as a printable PDF. The issue of “human-grade pet food” is complicated. I misspoke in saying that the USDA governs “human-grade pet food” and that pet parents should look for pet food that is labeled by the USDA as human-grade. In fact, the USDA governs human food. The FDA oversees pet food (feed). At present, the FDA is trying to define pet food made of fresh, human-grade ingredients, as this is a new concept for the industry. Rather than look for USDA “human-grade pet food” as I stated, consumers should look on the labels for pet food made with human-grade ingredients.